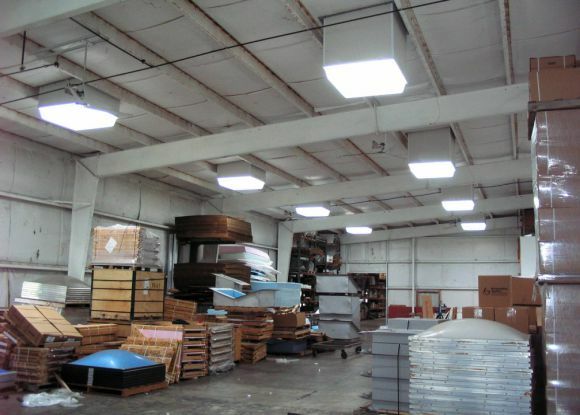 A high-performance daylighting system can provide an amazing transformation to your building. Ideal for low-rise, single-story commercial buildings, integrating natural lighting into your building comes with plenty of benefits. Tick Tock Energy can install a high-quality skylight that collects sunlight and channels through the roof and ceiling via a reflective tube, also known as a sun tunnel. A refractive lens on the tunnel’s interior appears just like a normal light fixture but provides an even distribution of lighting. From morning to late afternoon, your facility can operate in nearly all situations under 100% natural light. Interior lighting as good as outside? Before electricity was plentiful in the early 1900s most buildings were built with ample natural lighting. Big windows, skylights and atriums all funneled tremendous amount of natural light into houses and buildings. Years later, architecture began moving backwards for a few decades as most buildings were designed as closed-in boxes with no daylight entering the structure. Those buildings still exist today, but we can change this! Turn off your electric lighting system 8-10 hours per day and slow down your meter! A well-designed daylighting system can exceed your current light levels without any need for electricity during daylight hours. When all your electric lights are off, your power demand is zero. For many commercial buildings, demand or facility-related charges are set by the monthly peak demand, or by TOU (time of use) schedules. Since many commercial buildings set their peak demand during daytime operating hours, turning off your electric lighting can shed substantial load. Before the advent of the “built environment” where most humans spent their days outdoor, most folks today labor under artificial lighting which is often times of poor quality. With a daylighting solution or sun tunnel skylight from Tick Tock Energy, you can boost the well-being of your employees, customers, etc. with natural lighting. Full spectrum lighting is the purest method for accenting product packaging and displays. Color distortion and glare often result from artificial lighting. Tick Tock’s daylighting solution delivers full-spectrum light and maximizes the range of product appeal and labeling with amazingly vivid illumination. Studies have even shown that retail sales can increase when natural lighting is used. Is your company driven to meet challenging energy reduction or sustainability goals? Tick Tock Energy’s daylighting systems can reach additional cost and energy savings not attainable from a conventional (electric) lighting upgrade alone. Our expertise with LED lighting, fluorescent lighting, and daylighting systems provides a comprehensive solution that helps you achieve your goals and operate more sustainably. You can count on no leaks from a Tick Tock Energy Daylighting Solution. Our products are manufactured by an Amish company that began in the metal building business fixing leaking skylights. When problem meets opportunity, a breakthrough is achieved! Corporate real estate owners and executives can boost your building’s property value by investing in natural daylighting systems. Daylight has an important role in architecture, and its presence or absence may influence the renting decisions of prestigious tenants. Boost your net operating income (NOI) by lowering your electric bill. Or, if the tenant pays for the electric cost, a low-cost operating system makes your space more attractive than your competitor which will likely boost long-term occupancy and desirability for your space. The sun tunnel has a unique design that captures sunlight in a concentrated shaft and disperses it into a broad lighting pattern. Sunlight enters a clear parabolic dome and inner lens, then enters a shaft with highly-reflective and insulated panels which amplifies the lights. The concentrated light is then diffused through a ceiling lens to provide adequate indoor lighting, using zero electricity. Our sun tunnel shafts are available in a variety of lengths to accommodate a custom solution for your building or home. Combine both a daylighting system and solar energy system for maximum energy savings and facility transformation. Use your rooftop to produce both power and light! Contact a Tick Tock Energy consultant today and we can supercharge your energy reduction plan by integrating both solutions. Below the roof, it may be the perfect time to also upgrade your lighting to LED lighting which helps make your entire lighting system function together seamlessly.